Golden Triangle, MS — Peco Foods CEO Mark Hickman announced that the company is locating in the existing 185,000-square-foot warehouse formerly occupied by AmeriCold. The facility is located in West Point, Mississippi, on 37 acres strategically located near interstate and major rail corridors. The location will provide freezer, cooler and working space to enable the company to serve its extensive customer base, which includes national restaurant chains. The investment totals $40 million and will create 300 jobs in the area. “The addition of the West Point facility to the Peco Foods’ portfolio and the creation of so many new jobs for the people of the Golden Triangle Region demonstrate how existing companies in our state benefit from our productive workforce and prime location in the fastest growing region of the U.S.,” Gov. Phil Bryant said. Vidalia, LA — Governor John Bel Edwards and Syrah Resources CEO Shaun Verner announced the company has selected a Vidalia site as its preferred location for its $25 million capital investment to develop a graphite processing facility in Louisiana. The Concordia Parish plant will produce graphite anode materials for batteries in electric vehicles and other products. The company, based in Melbourne, Australia, plans an initial graphite processing plant in a 50,000-square-foot industrial building it intends to purchase near the Vidalia Port. The building can be expanded at a later date, should Syrah develop additional phases. Photo caption: Idaho team members join Takayuki Ishimori, Mayor of Hachioji City, Tokyo at a welcome event in Japan. Pictured left to right: Celia Gould, Director, Idaho Department of Agriculture; Bobbi-Jo Meuleman, Director, Idaho Department of Commerce; Kelly Anthon, Idaho Senator/City of Rupert Administrator; Mayor Ishimori; Jan Rogers, CEO, Regional Economic Development for Eastern Idaho; and Dr. Marc Skinner, Executive Officer, University of Idaho’s Eastern region. University of Idaho, Idaho Senator/City of Rupert Administrator Kelly Anthon, Idaho Departments of Commerce and Agriculture, and REDI complete six-day visit to Japan to promote foreign direct investment in Idaho. Idaho Falls, ID — Regional Economic Development for Eastern Idaho (REDI) CEO Jan Rogers reported significant success from the Idaho team that just returned from a foreign direct investment trip to Japan April 13-18. “Reciprocity is an important part of Japanese culture. With Eastern Idaho’s new and growing relationship with Sakae Casting and Ohzen’s operations in Idaho Falls, this Japan trip was a great opportunity for us to build on our Japanese partnerships and expand Idaho’s connections in Japan,” Rogers said. “We put Idaho on the radar for Japanese businesses considering investing in the U.S. In fact, several companies are already planning to visit Idaho this summer. It was a very successful visit,” she said. The trip, coordinated by REDI, was joined by the University of Idaho, Idaho Senator and City of Rupert administrator Kelly Anthon, and Idaho Departments of Commerce and Agriculture. Select Idaho team members met with government and commerce officials, vice governors, mayors, university president and leaders, chamber of commerce representatives, and numerous industries representing nuclear energy, research, food production and processing, and manufacturing. At a business exchange meeting in Hachioji City, several organizations and nine companies discussed possible opportunities for their businesses in Eastern Idaho and Idaho. There was also a visit to Tokai mura’s Sister City Center, Idaho Falls’ Sister City in Japan. St. James Parish, LA — Governor John Bel Edwards and Formosa Petrochemical Corp. executive Keh-Yen Lin announced the company has selected St. James Parish in Louisiana for a $9.4 billion chemical manufacturing complex and has purchased a 2,400-acre site along the west bank of the Mississippi River. Concord, NH – Governor Chris Sununu and State officials confirmed that Lonza Biologics, Inc. will be moving forward with the expansion of its Portsmouth facility, adding up to 1,000 jobs and up to one million square-feet of space. The company currently employs 800 at the facility where it primarily focuses on contract manufacturing. Plainview, TX — The Plainview - Hale County Business Park Groundbreaking Ceremony is scheduled for Monday, April 23rd at 2:00 p.m. at the Business Park located on Interstate 27, north of Highway 194 (Dimmitt Highway). Congressman Jodey Arrrington is scheduled to attend the ceremony as well as U.S. Economic Development Association Representative Trisha Korbis. Others in attendance include Mayor Wendell Dunlap, Hale County Judge Bill Coleman, Hale County Commissioners, Plainview City Council and the Plainview/Hale County Economic Development Corporation. The public is encouraged to attend. Wilmington, OH — The Wilmington Air Park has once again earned its Federal Aviation Administration (FAA) Part 139 Certification, affirming that the airport facilities, infrastructure, staffing, and operations protocols are on par with other large airports around the country. Airport operating certificates serve to ensure safety in airport transportation. An airport, in order to secure this certification from the FAA, must implement and maintain a significant level of operational and safety standards and provide for such things as on-site firefighting and rescue equipment and personnel. Santa Fe, NM — Wind power, the largest source of U.S. renewable electricity generating capacity, now supplies more than 30 percent of the electricity in four states, Iowa, Kansas, Oklahoma, and South Dakota, after strong growth in 2017. Industry leaders released the news from the state capitol in New Mexico, a rising star for wind power. New Mexico added wind power capacity at a faster rate than any other state last year. The rapid expansion of American wind power reflects its key role at the center of a transformation in the country’s electricity sector – bringing consumers more affordable, clean, and reliable energy while growing the economy. The industry’s latest trends and milestones from 2017 are detailed in the American Wind Energy Association (AWEA) U.S. Wind Industry Annual Market Report 2017 released today. According to the new report, more American homes and businesses use wind energy than ever before and the industry employs a record 105,500 men and women across all 50 states. Montgomery, AL — Hyundai Power Transformers USA, Inc. (HPT) has announced a $33 million expansion of its Montgomery facility resulting in the creation of 86 new jobs. The expansion will enable the company to establish a "Smart Factory" and increase production of its power transformers by more than 60 percent. The expansion will include a newly-constructed training facility that will contribute to fostering an advanced labor force, taking the company one step closer to achieving its plan of generating $200 million in revenue by 2021. Kyle, TX – A new key commerce area is breaking ground in one of the nation’s fastest-growing cities -- Kyle, Texas, just twenty-minutes south of Austin-Bergstrom International Airport. Hays Commerce Center, which sits on 108-acres, is a mixed-use master development situated on the west side of I-35 between Loop 4 and Kyle Crossing. 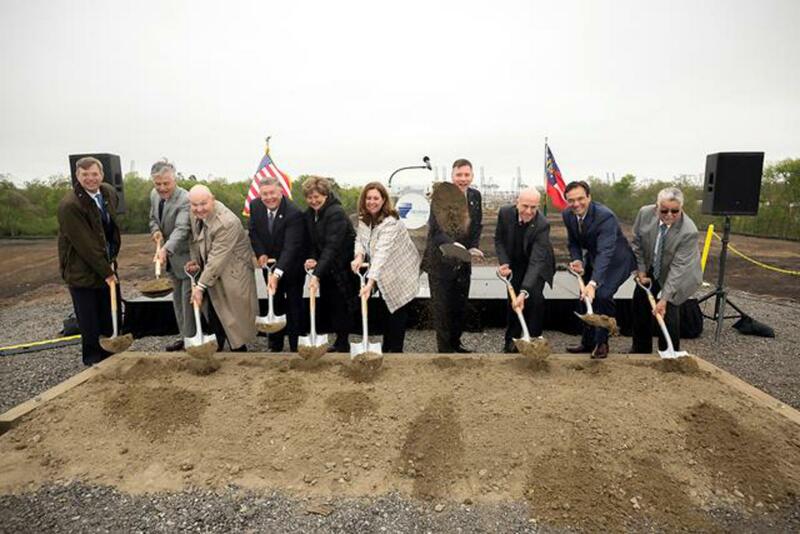 Reserve, LA -- On April 12th, Port of South Louisiana commemorated the 25th anniversary of operations of its transshipment center, Globalplex Intermodal Terminal. The Port of South Louisiana has invested over $104 million in construction, upgrades, and improvements, which were made possible in part by grants received from Louisiana’s Capital Outlay and Port Construction and Development Priority Programs as well as other federal and state grants. Located in Reserve, Louisiana at the site of the former Godchaux Sugar Mill on the Mississippi River, the 335-acre multipurpose terminal, which handles, on average, 1.1 million tons annually, can accommodate dry bulk, breakbulk, containers and with some retrofitting, liquid bulk. Globalplex is easily accessible by way of land, water, rail and additionally, air. Albuquerque, NM — Leprino Foods, a Denver-based company that claims to be the world’s largest mozzarella cheese maker, is investing $15 million to expand its Roswell manufacturing plant. The state is providing up to $200,000 for the expansion through the Local Economic Development Act. The expansion will add five jobs to the 552 already at the site, according to a news release from the state’s Economic Development Department. LaPlace, LA — On April 5th seaports of the Americas will again celebrate Western Hemisphere Ports Day, an opportunity to highlight our industry’s role in job creation and economic prosperity. Ports are a vital part of the transportation infrastructure within the Western Hemisphere connecting farmers, manufacturers, workers and consumers to the global marketplace. Led by the American Association of Port Authorities – and united in our common goal of creating prosperity throughout the Hemisphere – we are proud to join hundreds of ports in North, Central and South America, and the Caribbean, to highlight and celebrate the value of ports. Columbia, SC — Governor Henry McMaster and the S.C. Department of Commerce announced that Universal Forest Products, a provider of wood and wood-related products, plans to open a manufacturing facility in Orangeburg County. Operating as UFP Cameron, LLC, the $6.1 million facility is projected to create more than 120 new jobs over the next several years. UFP Cameron, LLC will be located at 106 Logistics Drive in Cameron, S.C. and is expected to come online in the fourth quarter of 2018. The facility will be dedicated to manufacturing products for the industrial market.